One perennial that will be more common in my gardens and in my recommendations next and future seasons is Four Nerve Daisy. The few in our experimental gardens now have bloomed all winter. Try this tough and drought tolerant flowering plant. Hopefully it will do as well for you as it has for me. 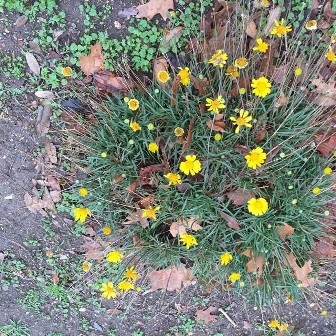 GROWTH, HABIT, CULTURE: Four-nerve daisy is a low growing, upright perennial to 1 foot, from a woody base. The solitary stem is branched at the base forming a clump. The solitary flower heads occur at the end of silky, leafless stalks. The tip of each yellow rayflower is three-toothed. Long, narrow, silvery-green leaves are crowded mostly toward the base. It’s native to dry plains and rocky hillsides. It is reported to grow in the lower 48 states, but it appears to be able to grow almost anywhere in the country where the drainage is good. 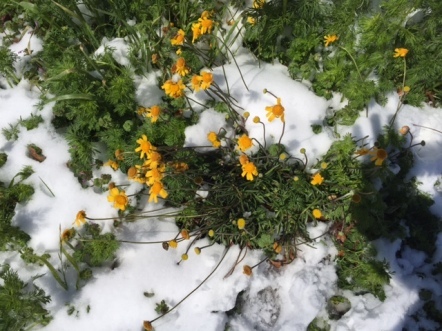 Blooming right through the snow. PROPOGATION: Seeds. Collect seeds when they fall off easily, year-round. Fresh seed may germinate better. MAINTENANCE: Slow growing plant that does not need much water or consistent water. COMMENTS: Four nerve daisy is heat and drought tolerant. It prefers dry, well-drained rocky, clay and limestone soils. The grass-like foliage works well in sunny rock gardens, container gardens and borders. Blooms often throughout the winter months. Flower petals become reflexed with age and remain on the plant a long time. Flowers have an unpleasant odor when picked.